A technique for measuring optical beam shear is based on collecting light from the four quadrants of the beam and comparing the optical power collected from each quadrant with that from the other three quadrants. As used here, "shear" signifies lateral displacement of a beam of light from a nominal optical axis. Composite elastic skins having tailorable mechanical properties have been invented for covering shape-changing ("morphable") structures. These skins are intended especially for use on advanced aircraft that change shapes in order to assume different aerodynamic properties. High-performance materials such as ceramics, optics, and alloy steels are manufactured using abrasive grinding technology. Until now, the grinding wheel and process conditions have been difficult to measure in production. View these and other new products on display by exhibitors at Photonics West, January 23-25, in San Jose, CA. 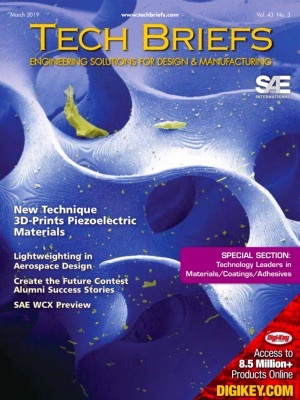 Visit Photonics Tech Briefs at Booth 435. Visit http://spie.org/Conferences/programs/07/pw/ for more information.